The 11-room, 3,300-square-foot antique colonial at 53 Sylvan Road North was built in 1816 but contains many modern amenities. WESTPORT — Modern agricultural practices, refrigeration, and transportation have allowed people to consume fresh fruits any time of year. Even so, there is no comparison to the flavor of freshly picked fruit in season; which is all the more sweet and delicious when it is grown on trees and bushes in your own backyard. 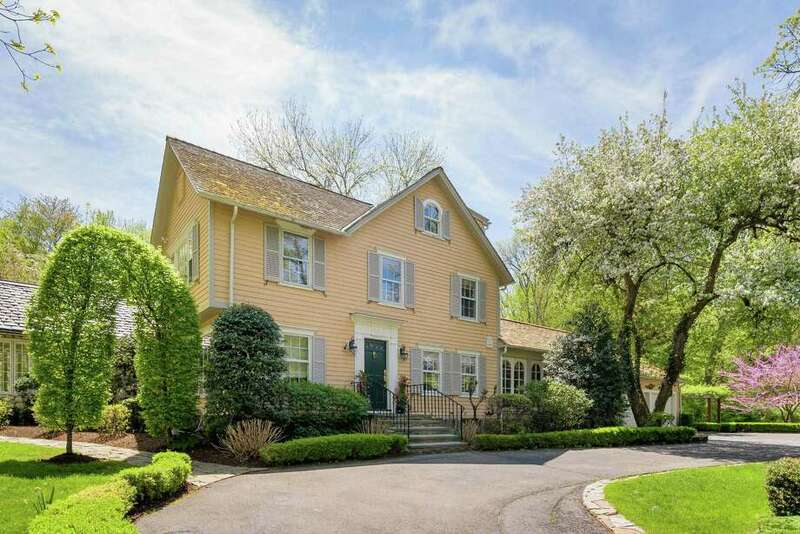 The property at 53 Sylvan Road North provides a cornucopia of fruit trees and bushes that will have its owners eating fresh fruit, and probably baking fresh pies or making jam, all summer long. The apricot tree bears fruit in May. The plum tree usually has fruit from May through September. Gooseberries can be harvested beginning in early July and blueberries for the month of July. That’s one tasty fruit salad the owners can put together in their custom walnut kitchen. Also found on this 1.36-acre level property are specimen plantings and perennial flowers that combine to create a visual feast including daffodils, lilacs, irises, pink and white climbing roses, and lilies. They not only provide color; they fill the yard with floral fragrance. Among the many flowering trees are a magnolia, a pink dogwood, a crabapple, and an ornamental cherry. The biggest, and perhaps best “flower” in the garden is the 11-room, 3,300-square-foot antique colonial John Taylor house. It was built in 1816 in the Old Hill neighborhood and was renovated from the ground up to provide it with modern amenities. This property has fertile soil; there are three other “blossoms” worth noting. The first building is a small barn with a pony stable. It was part of the farm that was originally on this property and now serves as a storage or garden shed. The second out-building houses a gym but could be a playhouse. The third is used as an artist’s studio or guest quarters. The gym and artist’s studio are livable/working spaces with heating and air conditioning. Both have underground computer wiring. The studio has a hardwood floor and a sink area with an electric hot water heater. The gym has a ceramic tile floor. “A rose trellis climbs up the side of the studio, and small pink roses cover the roof all summer long,” the listing agent said. The gym exterior is adorned with clematis and white roses. This charming slice of paradise sits in a private setting with three sides surrounded by old fieldstone walls and the fourth is bordered by a pond. The pond does not lie within the lines of this property but the owners can enjoy the water view. Despite its private location this house is convenient to the Post Road (Route 1), downtown Westport, and the Saugatuck Metro North train station. The house is on the shuttle line to the train. If the owners prefer to drive and park at the station the train is only a six minute drive away. It is also close to Earthplace, the nature discovery center on nearby Woodside Lane. Enter the property through the openings in the moss-covered fieldstone walls and antique gate to the semi-circular driveway lined in Belgium block. The front garden has a variety of hydrangeas, azaleas, and boxwood hedges. Walk up the steps to the forest green front door of this coral-colored clapboard house with pale gray shutters. The front door is framed in decorative millwork and has four panes of bullseye glass. Throughout the main living level the floors comprise quarter-sawn red oak. From the foyer there is a multi-paned door into the office with two walls of built-in cherry wood cabinetry and shelves. Visible from the windows in this room is a sizable functional birdhouse that is a replica of this home. French doors lead into the formal dining room, which is open to formal living room. It features a vaulted ceiling and six sets of French doors, three on the front wall and three on the back wall. The back doors open to a stone patio with an outdoor fieldstone fireplace, stone sitting wall, and built-in grill. Outside, there are multiple patios and three areas with vine-covered pergolas, enhancing the indoor-outdoor living. Features in the gourmet kitchen include counters and a breakfast bar topped with honed granite, a large sink plus a brass butler’s sink, wine refrigerator, walnut cabinetry with nautical brass hardware, slide-out drawers and cutting boards, built-in desk area, and a pot-filler next to the Viking Professional six-burner range. The breakfast bar accommodates three stools and has a brass foot-rest. The kitchen opens to the family room, which features a fireplace with hand-painted Dutch tiles that are original to the house, floor-to-ceiling bookshelves, and two sets of French doors to a terraced patio and pergola so thick with wisteria vines that it is protected from rain. The sunroom doubles as a play space, and it has a radiant heated slate floor. There is a full bath in this area of the house. The staircase to the second floor features a carved antique balustrade. Upstairs, there are three large bedrooms, all en suite with new baths. The master bedroom boasts a walk-in closet, dressing room, and large bath, which is very unusual for an antique home. It has a glass-enclosed shower, double marble vanity, and deep claw-footed antique tub. Another bedroom has a fireplace and its bath has a decorative mosaic tile designed floor. The fourth bedroom is found on the third floor. Its bath is quite unique with a glass shower in the middle of the room; arched windows and window seats on both sides. For more information or to set up an appointment contact Donna Beretta of William Raveis Real Estate at 203-451-1540 or berettad@raveisre.com.